Royal Purple specially formulated their SAE grades to be suitable for engines from trucking to general transportation. Excellent for today's turbo, supercharger and even warranty motors. Motors stay cleaner and cooler, resulting in better gas mileage, superior engine protection, and longer oil life. Now API certified. 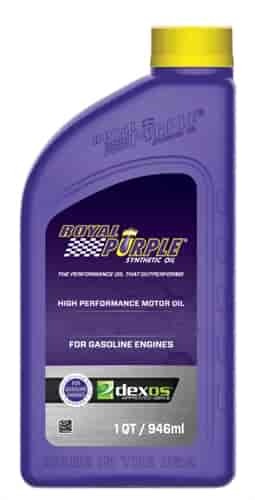 Royal Purple specially formulated their SAE grades to be suitable for engines from trucking to general transportation. The now API Certified oil is excellent for today's turbo, supercharger and even warranty motors. Motors stay cleaner and cooler, resulting in better gas mileage, superior engine protection, and longer oil life. Increased pressure is met with increased viscosity to meet the demands of your modified engine with a higher level of performance and protection. 01030 is rated 5.0 out of 5 by 4. Rated 5 out of 5 by Dmboat from Great product/best price/& free shipping! Always use Royal Purple oil in equipment I care about. Couldn't find better deal with free shipping!! Rated 5 out of 5 by Larry Twi from awesome product!! Ive always used other "race" oils in my mustang. However this time i let a buddy talk me into using royal purple. I noticed less valve noise and the engine just seems to run smoother. Needless to say i will be running royal purple now in my stroker engine!! !